Well, it's that time of the month again! 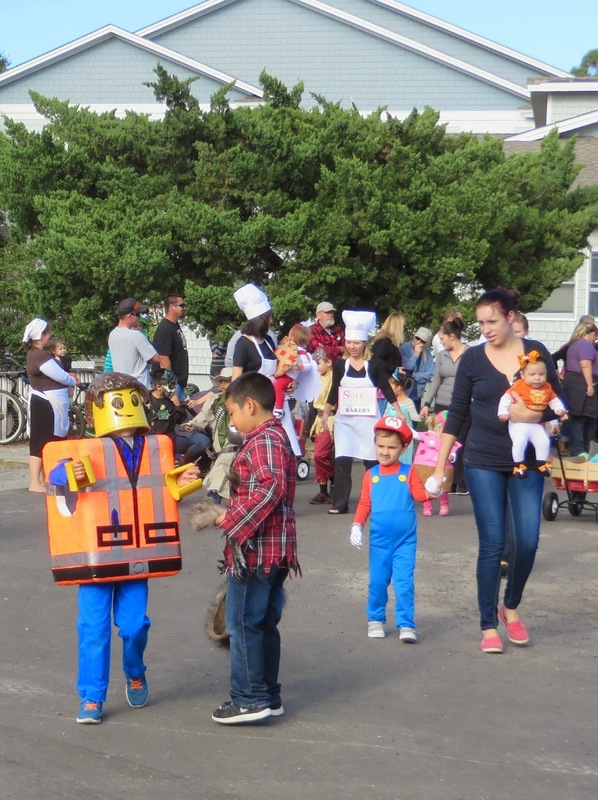 We've recently published our latest Ocracoke Newsletter. This month's article is a reprint of a 1910 account of hunting for waterfowl at Ocracoke. You can read it here: http://www.villagecraftsmen.com/news102114.htm. As I mentioned yesterday, I will no longer be publishing posts on weekends. Look for more Ocracoke Island stories & history tomorrow. I have been thinking of doing this for a while, and now it begins. Starting today, except under unusual conditions, I will not be publishing blog posts on Saturdays or Sundays. So, please check back again on Monday. I will continue to publish Ocracoke Island stories, history, and current events on week days. I love collecting and sharing these stories. I hope you will continue to enjoy reading them. "Corning" means to preserve in salt. On the Outer Banks before refrigeration, fish were often "corned" to preserve them. Corned fish were packed in wooden barrels with tight fitting lids to keep varmints out. The barrels were stored in the shade, and the fish would keep for many months. "The fish should be scaled, beheaded and gutted. No trace of entrails or the black membrane that lines the cavity of the fish should remain. Then the fish should be butterflied, so the maximum amount of flesh will be exposed to the salt.... Once the fish is prepped, sprinkle the bottom of the container with a 'heavy dusting' of salt. Lay the fish on the salt and give it a heavy dusting - it is not necessary to completely cover the fish with salt. Continue layering fish and salt. Seal the container and place it in the refrigerator [obviously, old-timers did not have this option, but corning still worked]. "After three or four days, the salt should have pulled the water from the fish to create a brine. Keep an eye on the water level, and when it stops rising, open the container and add enough fresh water to cover the fish completely and enough extra salt so that crystals are visible. You want to have the water dissolve as much salt as possible. The fish is safe to eat when it is "struck through," meaning that the salt has completely penetrated the flesh. To determine if the fish is struck through, press the flesh with your finger. 'It should be firm, hard, like a board,' Merritt [Jim Merritt, owner of The Catch Seafood at Five Points Community Farm Market in Norfolk] said. 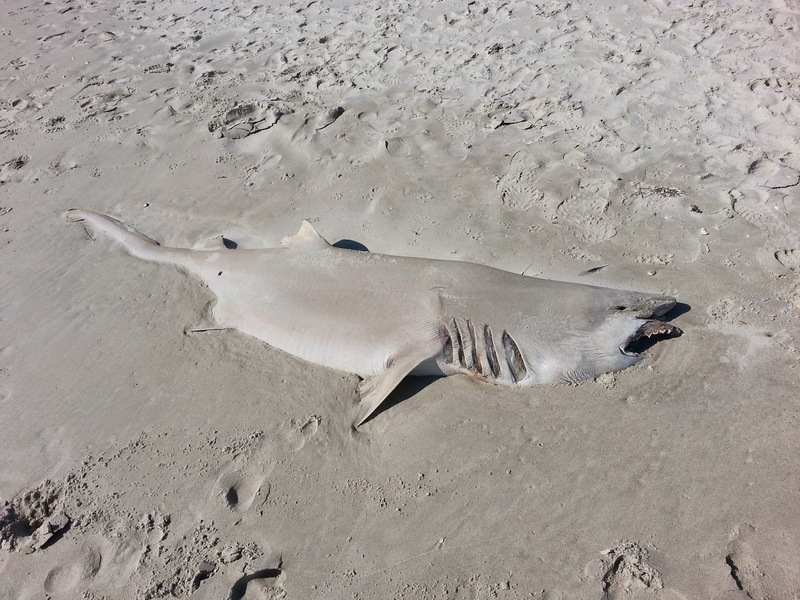 After that, it no longer requires refrigeration and is ready to eat...."
In the Fall, 1973 issue of Sea Chest, a publication of the Cape Hatteras School, there is a one-page article titled, "Spies on the Cape." According to the article (which I found more than a little bit confusing), a young German named Hans Hoff visited Hatteras Island for about a month in 1932. During that time he allegedly took photos of the lighthouse, Coast Guard Station, weather bureau, etc. Later, during WWII, he and two other German spies were said to have landed on Long Island, New York, in a rubber raft. They were apprehended, tried, and convicted. Hoff, according to the article, was sent to the electric chair. The article even indicates that a movie was made about this event. Trouble is, I have not been able to verify any of this story. The only Hans Hoff I have been able to document was an Austrian Jew (born 1897). He was a psychiatrist who was expelled from Austria in 1938. Hoff seems to have been a shadowy figure who worked as an agent for the OSS, and went to Iraq where he was involved in very questionable practices involving eugenics and experiments on human subjects. Were there German spies on the Outer Banks during Wold War II? We may never know for sure. During the latter half of the twentieth century I occasionally heard stories of German spies landing on the Outer Banks during World War II. In my article about Mme. Scheu-Riesz and the 1940 & 1941 summer Artists Colony on Ocracoke (http://www.villagecraftsmen.com/news112908.htm), I wrote, "Rumors circulated throughout the village suggesting that [Mme. Scheu-Riesz] and her fellow artists might be German spies. Although only a handful of islanders held this view, those closest to the artists reported that they were secretive, and reluctant to socialize with villagers. Workers at the hotel noticed that Workshop teachers and students covered their books and poems, and turned papers over whenever others approached them. "Most of the Workshop participants enjoyed spending their days on the beach. Islander, Jake Alligood, had an old flat bed truck that he had converted to an island taxi, and he often drove them across the tidal flats to the ocean. It was not unusual for the teachers and students to walk to the beach after dark. Mme Scheu-Riesz seemed especially interested in the flashing beacons and other navigational aids, about which she asked numerous questions. She was also observed making frequent calls, by ship to shore radio, from the Coast Guard Station. "Several island teenagers, intrigued by the exotic artists and intellectuals, and looking for adventure, decided to snoop around their quarters. They had listened to adults as they discussed the artists' unconventional behavior and different lifestyles. 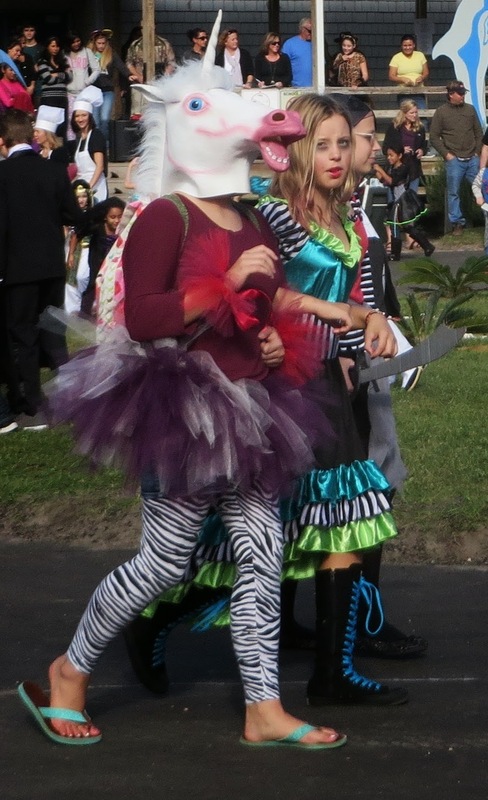 Connections to foreign countries, strange dress, and a degree of eccentricity had made them suspect. Could the artists really be undercover Nazi spies? "The 'detectives' never discovered any incriminating evidence." Read the entire article (http://www.villagecraftsmen.com/news112908.htm) to learn why Mme. Scheu-Reisz and her colleagues were almost certainly not spies. More about spies on the Outer Banks in tomorrow's blog. If you wear socks to bed you will wake up with a sore throat (as a teenager I often went to bed with socks on because I'd go out barefooted in the evening and come home late, too tired to wash my feet...but I never remember waking up with a sore throat). If you sweep after sundown, you will sweep a member out of your family (seems like a creative justification for not working at night). If you go in the front door, and out the back door, you will have bad luck (Blanche often reminds me of this when I visit her). If a bird gets in the house, it means bad luck (a house wren once found an opening, and built a nest in my screen porch; when the eggs hatched the baby birds flew all around the porch, pooping on everything. It was definitely bad luck!). When I was a teenager I came across this quotation by Francis Bacon (1561-1626): "The general root of superstition is that men observe when things hit, and not when they miss, and commit to memory the one, and forget and pass over the other." Numerous booklets, articles, and book chapters about whaling and porpoise fishing on the Outer Banks (look for a Newsletter article about this in 2015). I also recently watched Woody Allen's movie, Annie Hall. And I started worrying that I might be like Alvy Singer, reading too many serious books! Then I remembered that I also enjoy The Funny Times. Maybe some of our readers have book suggestions for me and other folks who follow this blog. Leave a comment if you do. In the colonial period and beyond, ships risked running aground attempting to cross the bar at Ocracoke Inlet. Pilots, seafarers familiar with local conditions, were established at Ocracoke in the early 1700s (the earliest name for the nascent village was Pilot Town). The pilots' task was to guide ships across the bar, and bring them safely into Pamlico Sound. The pilot boat was typically double-ended, 20 – 25 feet long, and high in the bow and stern. 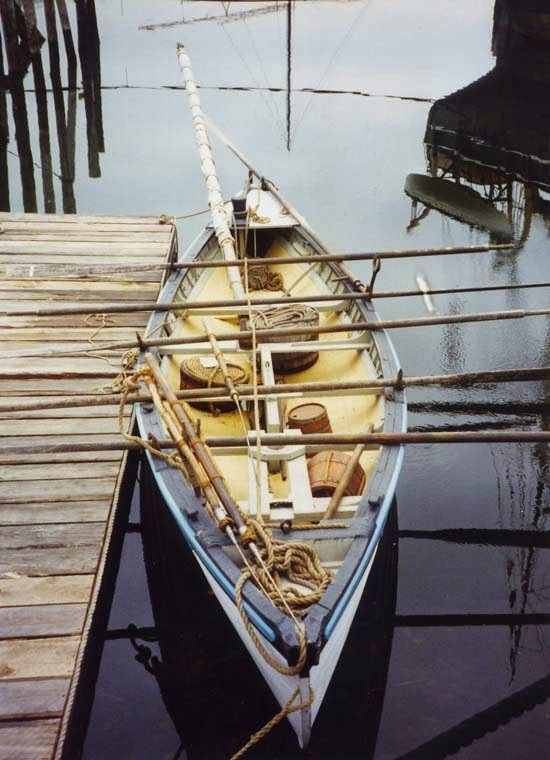 The hull was constructed of lapstrake planks (overlapping planks of cedar, cypress, or other native wood). The lightweight pilot boat could be outfitted with a mast and sail, or it might be rowed by 4 to 6 men. Rowed pilot boats were used later in the eighteenth century and into the early twentieth century by shore-based whaling operations along the Outer Banks. It is a fascinating story. Look for an article about North Carolina whaling in a future Newsletter. OPS is planning another Art Show & Auction for January, 2015. This is how it works: Just request a small blank canvas from OPS (Phone: (252) 928-7375 Mail: Ocracoke Preservation Society P.O. Box 1240 Ocracoke, NC 27960 E-mail: info@ocracokepreservation.org). Amy will send it right out to you. Then create your work of art...in any medium -- oils, acrylics, watercolors, collage, photography...and send it back to OPS. The 2015 Art Show & Auction will be held Saturday January 24, 5-7pm. Fabulous artwork done by incredible people will be available at this silent auction event. Hors d'oeuvres and wine will be served. Request your canvas today! And be part of this wonderful, creative fundraising endeavor. 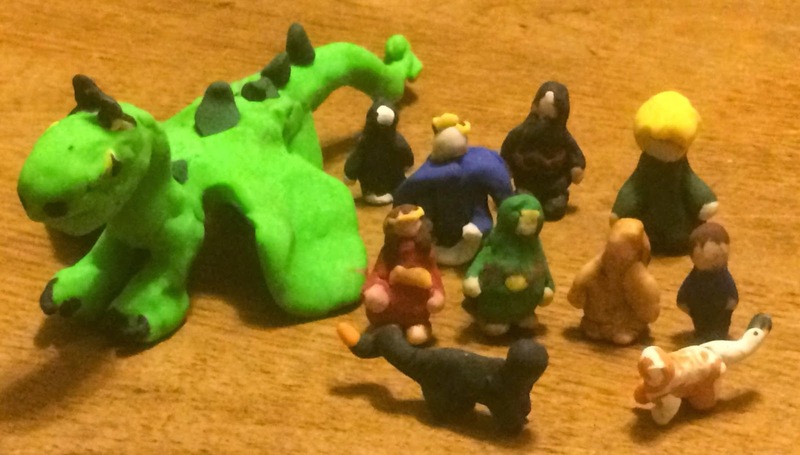 Lately, he has been creating small critters with low-fired clay. 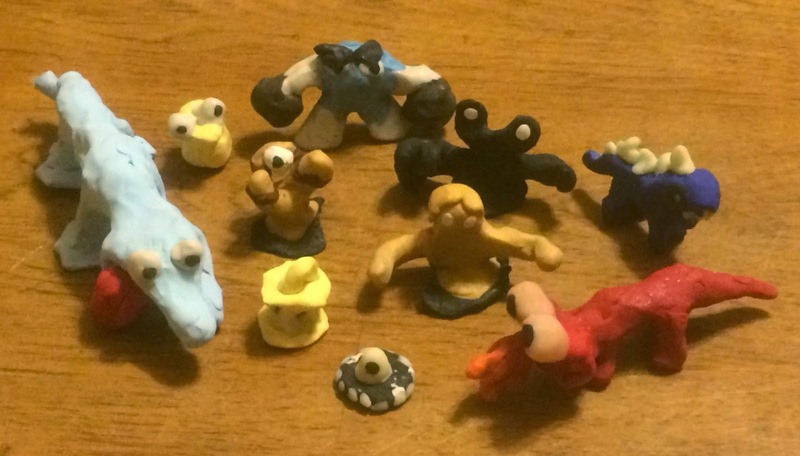 Just thought I would share a few of his many creations. While reading a 1973 issue of Sea Chest, a journal of Outer Banks history & stories published by Cape Hatteras High School students, I was reminded of the Pellitory Tree, also called the Toothache Tree, or Southern Prickly Ash. These small to medium sized trees are not abundant on Ocracoke, but can be located throughout the island. The Toothache Tree sports sturdy thorns on its trunk and branches. Chewing on a sliver of the tree's bark will numb the mouth and tongue, and was used to relieve the pain of a toothache. A piece of the bark inserted in a cavity would help ease the pain, and a sack of the bark held against the gums will relieve pain and swelling. Charles Caswell McWilliams (1892-1972) carried mail by truck from Hatteras to Ocracoke between 1949 and the early 1970s. 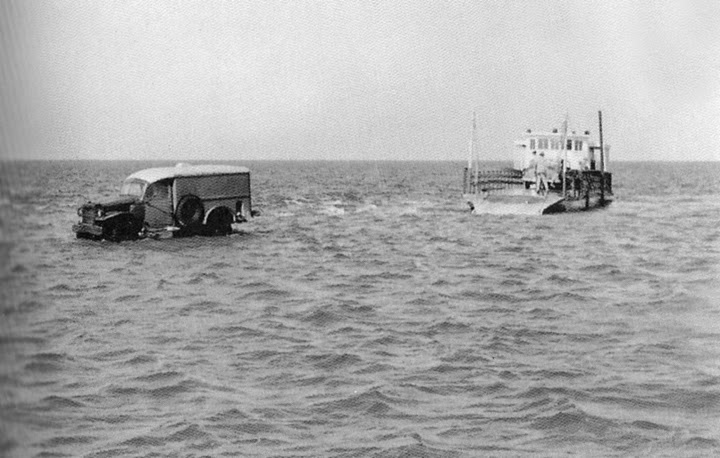 During the 1940s and early 1950s there was no paved road to Hatteras Inlet. "Charlie Mac," as he was called by most, drove a 4-wheel-drive Army surplus ambulance. 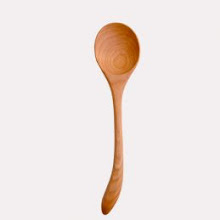 Charlie Mac was also an accomplished carver. See our earlier post for photos of some of his carved birds. Charlie Mac, who was rarely seen without his cigar, was the grandson of John Small McWilliams (1823-1889), a merchant from Washington, NC who moved to Ocracoke at the outbreak of the Civil War to teach school. Charlie Mac's father, John Wilson ("John Mac") owned a store on Cockle Creek (Silver Lake), and was appointed postmaster in 1883 at a salary of $24.52 per month. John Mac's brother, Charles Small McWilliams, was the keeper of the Portsmouth Island US Life Saving Station. Today there are no McWilliamses living on Ocracoke, although several of Charlie Mac's descendants live here or still own property on the island. ...in 1889 the steamship "Pioneer" wrecked on Ocracoke beach. "It was like manna from heaven when the vessel 'Pioneer,' a heavily loaded wooden freight steamer, was wrecked off Ocracoke in a violent storm back in August, 1920 [actually it was October 14, 1889, as I know for certain from my great-grandfather's shipwreck report, and from other reliable sources]. "Everything from Bibles to cabbages floated ashore. Hams, bananas, barrels of flour, casks of alcohol, bladders filled with snuff and a great deal of canned food came into the Island, which was flooded by the tide, and everywhere folks were knee-deep in water sweeping up valuable debris as things washed by them. "One old fellow threw away his old shoes when he spied a new pair drifting toward him, only to find the new ones were both for the same foot. One woman gathered up enough bladders of snuff to fill a barrel which she proudly kept upstairs in her house for all to marvel at. She happily contemplated a future with a plenteous supply of snuff. "The entire crew of the 'Pioneer' was saved, and they joined the islanders in rescuing the cargo. 'Come on over to my house--there's plenty to eat' was the cry of the generous native to any stranger around, for the wrecked cargo had yielded more than enough to supply the island with a day's rations. "The late Theodore S. Meekins, prominent Manteo real estate and insurance man, saw the wreck of the 'Pioneer' and remembered these incidents concerning it. He believed the 'Pioneer' was the last wooden steam vessel seen in these parts, and when it hit it went into pieces and sank almost immediately. The ship struck during the daytime and was plainly visible from the shore. The observers on shore could see the boat break into pieces and disappear into a raging sea. "Mr. Meekins recalled the auction held in connection with that part of the cargo not taken by the natives during the storm. There were only two magistrates on Ocracoke and both were fighting each other for the privilege of selling the cargo. A 50-gallon container of alcohol to be auctioned off had been considerably decreased by the frequent visits of natives down to take a little drink or two. "Finally, a few days before the auction, Captain Jim Howard stopped them by planting himself firmly on top of the barrel and guarding it with his life. When the barrel was brought up for sale at the auction Captain Jim was astride it, and he was sold with the barrel. He bought it himself for five dollars. "So keen was the auction that one barrel of flour brought six dollars. And after the sale the strangers who had come down to Ocracoke for the auction were treated grandly by the natives before time to depart." Madame Grace of Blackbeard’s Pirate Crew says the purpose of their living history encampments is to ignite peoples’ imaginations, and that’s what they will do the weekend of Oct. 31 to Nov. 2 during the Second Annual Blackbeard’s Pirate Jamboree throughout the village. 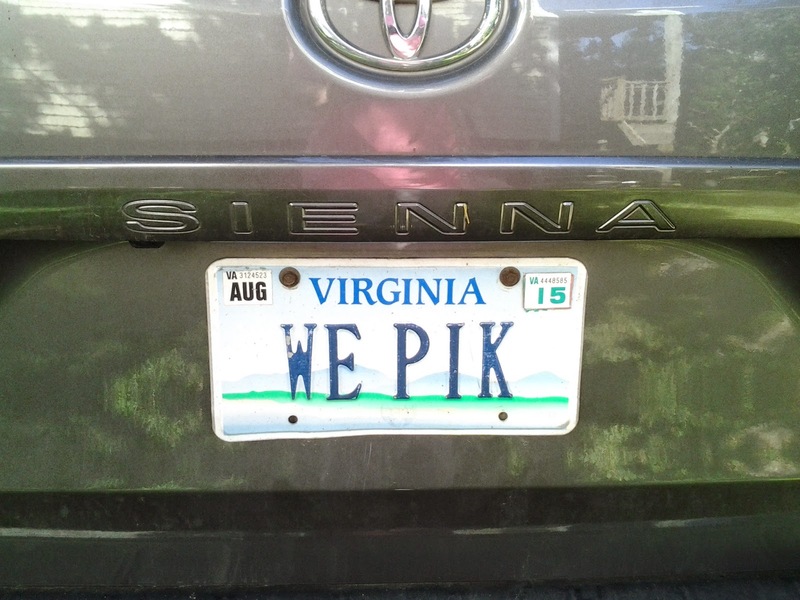 The Crew, from Hampton, Va., will camp the weekend in the yard of the Wahab House, 161 Irvin Garrish Highway. Following the game show, The Motley Tones, the minstrel group that was such a hit at last year’s event, will sing seafaing and piracy songs from the ‘60, ‘70s and ‘80s--that is, the 1760s, 1770s and 1780s. Saturday morning, the jamboree will begin at 10 a.m. with pirates on period ships shooting at pirates on the land. Other professional pirate crews attending include Captain Horatio Sinbad on his period brigantine the Meka II; the Ada Mae, a skipjack from New Bern; the Beaufort Oars in their sloop The Ranger; the Sea Scouts, a group of youths ages 14 to 20; The Shadow Players, a stage combat group from Raleigh and Chris Suttle, who will portray Blackbeard. 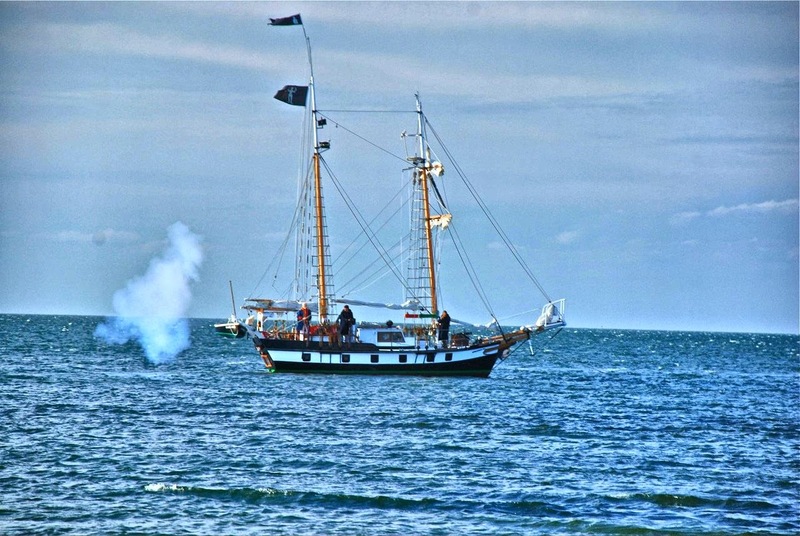 The main event will be the re-enactment of “The Battle at Ocracoke,” at 3 p.m. in Silver Lake harbor. Three ships will re-create the last hours of Blackbeard and his crew as Lt. Robert Maynard brings them to battle with cannons blazing. The Brigand’s Bazaar in Community Square will include vendors selling pirate-themed wares and food. Two beer gardens—at Live Oak Coffee across from Community Square and Teach’s Tavern at Books to be Red-- will sell grog. During the day, Duffus will give another talk about his scholarship on Blackbeard. New this year is the “Hunt for the Dirty Dozen of the Deep Blue Sea.” Attendees purchase cards featuring 12 of the invading pirates. Get all the pirates’ signatures and turn them in for booty at Teach’s Hole Blackbeard Exhibit. The cards and festival T-shirts will be on sale at the Information Booth in Community Square. Ocracoke was a favorite hiding place of Edward Teach, or Blackbeard. Ocracoke is where Lt. Robert Maynard finally located the pirate in 1718. After a ship-board battle of swords, Maynard severed the pirate’s head then took it to Hampton, Va.
Duffus also conducts the ceremony Sunday when the pirates march to Springer’s Point at 10 a.m. to commemorate the fallen pirate and his crew. Public parking is available at the NPS Visitors lot at the south end of the island, 4352 Irvin Garrish Highway. A complete schedule of events will be available at the Information Booth and is available at www.piratejamboree.com. On Wednesday, as I walked into my side yard, I noticed a painter had set up his easel by the road, and was intently engaged in his latest work of art. His name is Fen Rascoe, an accomplished artist from Windsor, North Carolina, working in oil, and painting in a contemporary impressionist style. He had nearly completed a painting of my wooden skiff when I encountered him. You can view more of Fen Rascoe's beautiful paintings here:http://www.fenrascoestudios.blogspot.com/. I have never been much of a fishermen, but occasionally have an opportunity to join friends out on the water. Yesterday Al asked me to join him and Frank. We anchored in about 6 or 7 feet of water out in Pamlico Sound, not too far from Portsmouth Island. In just over three hours we caught bluefish, speckled trout, red drum, and one Spanish mackerel. 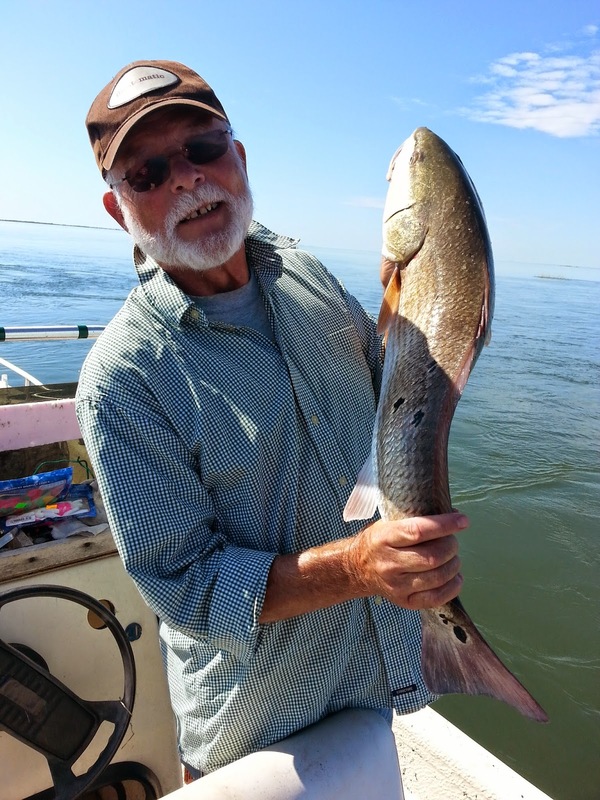 This red drum was 30" long, several inches over the legal limit, so I had to release him, but he was fun to reel in. 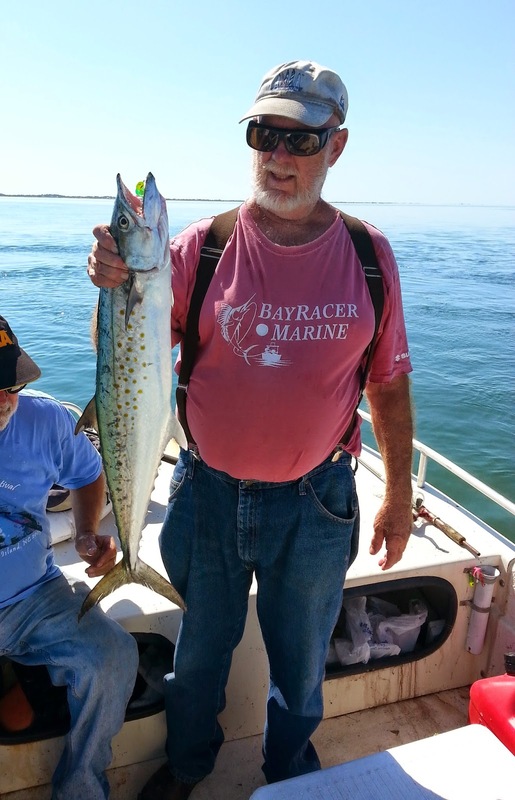 Al hooked a large Spanish mackerel...28" long. There is now a photo of him and his prize on display at Tradewinds Tackle Shop. It was the perfect day to be out on the water enjoying a little sport fishing. Here is another mid-1950s photo from the Mike Riddick Collection. 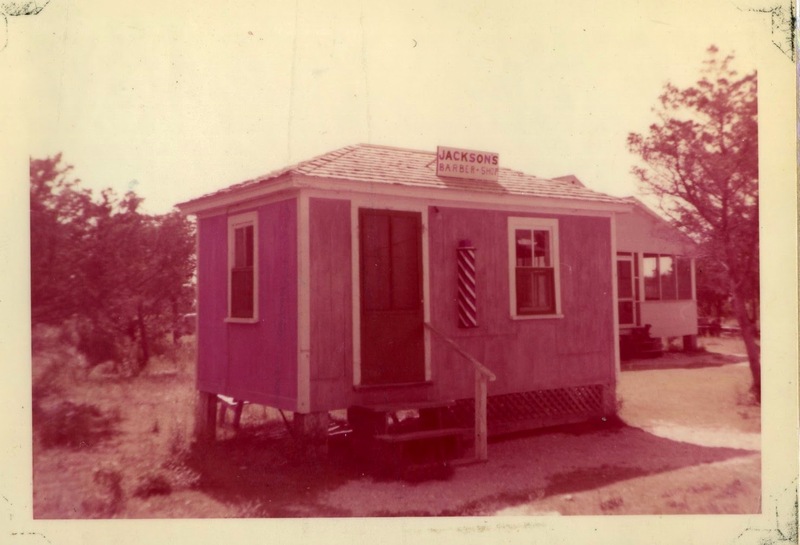 George Guthrie Jackson (1922-2005) operated his barber shop on the corner of Lighthouse Road and Moonlight Valley Road (between the lighthouse and the path leading to Springer's Point). I don't remember how much a haircut cost back then because my father always cut my hair. Maybe one of our readers knows. George Guthrie was the father of Jimmy Jackson, and the grandfather of Jamie Jackson, Ocracoke's car mechanics. George Guthrie's barbershop has been gone a long time. Today, Susie Hutchinson operates Halo Hair Studio at Angie's Gym on Sand Dollar Road. 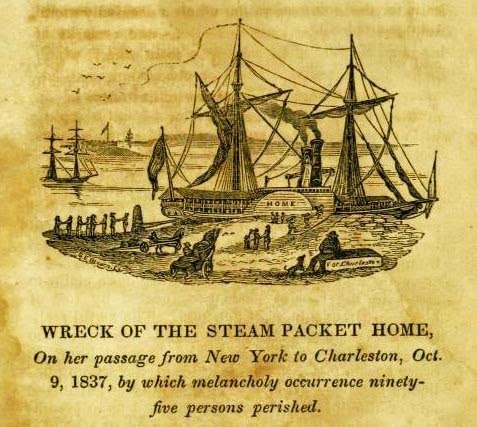 Today is the 177th anniversary of the wreck of the steamship Home. On this date in 1837 a violent storm drove the Home onto Ocracoke's beach. At least ninety people (men, women and children) lost their lives. This was the greatest sea disaster ever on the North Carolina coast. One year later, in response to the terrible loss of life, the US Congress passed a law requiring every sea-going vessel to carry at least one life vest for every person on board the ship. 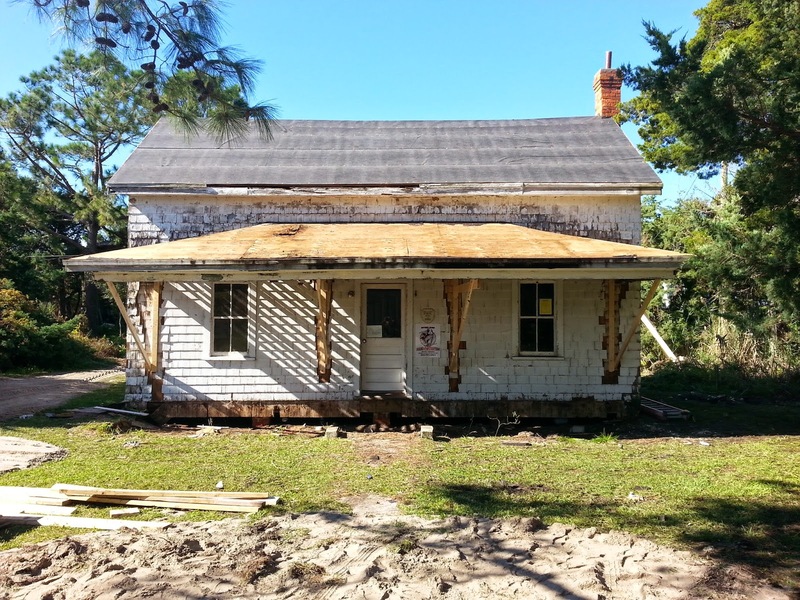 Ocracoke native, Walter Howard, chronicled the story of the Home in vivid detail. You can read it here: http://www.villagecraftsmen.com/news100104.htm. Last week I was invited to join several neighbors and friends for a house concert featuring the music of Steve & Penny Kilby. Steve was born in North Wilkesboro, North Carolina, into a musical family. 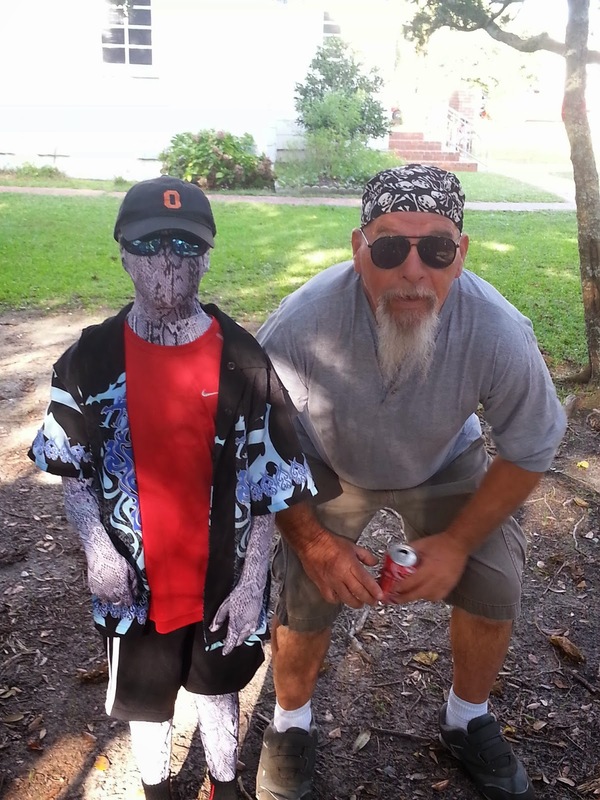 Steve said he grew up so far back in the sticks that even the Episcopalians handled snakes! 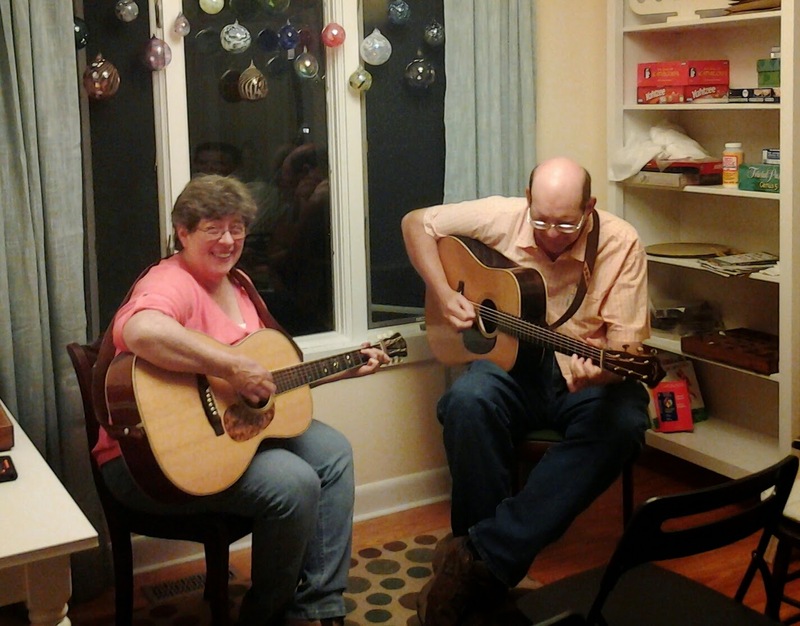 He and Penny, who now live in Virginia, entertained us with superb renditions of traditional mountain songs and bluegrass tunes. Steve began playing the guitar at age twelve and was taught his first chords by his grandmother and his first tunes and songs by his grandfather, a fine old-time fiddler and banjoist. 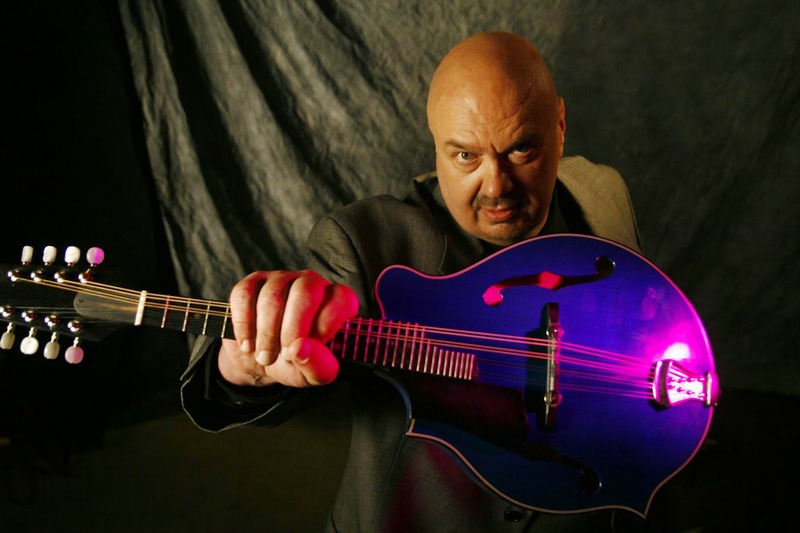 Steve has won many awards for his guitar playing, including the North Carolina state championship at Cool Springs School and first place at the 1970 and 1980 Galax Old Fiddlers' Conventions. He was also the "best all-around performer" at Galax in 1980. Steve, later a resident of Piney Creek, North Carolina, can also play the mandolin, mandola, and banjo. It was a fine evening of some of the best old-time mountain music I've ever heard. Many thanks to Debbie & Neal for hosting the event! Follow this link to visit Steve's web site: http://www.kilbymusic.com/index.html. 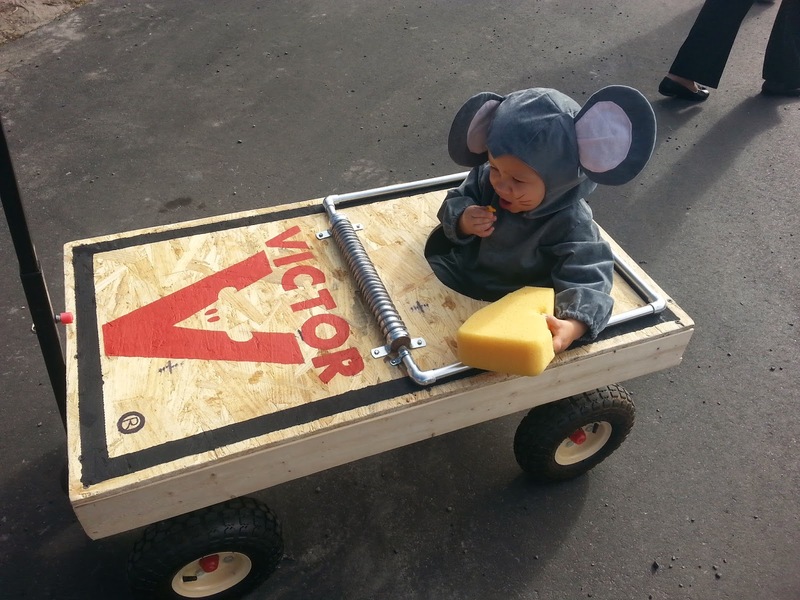 I published this story two years ago, but I think it's worth retelling! Islanders have always enjoyed playing tricks on each other...and they enjoy just as much telling the stories over and over. Back in 2004 Maurice Ballance (1927-2014) told me a story he had heard from Edgar Howard (1904-1990). The main character is Arcade Williams (b. 1842). 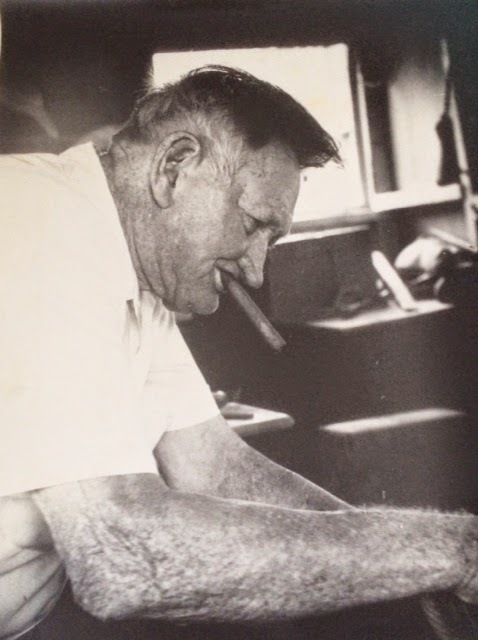 In the mid-1950s Edgar's brother, Walter, wrote this about Arcade: "Kade lived in an old house framed entirely from the beams of old shipwrecks. [She] could 'cuss like a sailor' and woe be unto anyone who 'ruffled' her feathers the wrong way, or should by any chance, be the recipient of her caustic, venomous tongue lashing. She is still remembered today for her biting wit and vitriolic sarcasm. Aside from those human weaknesses she was a good soul and didn't have an enemy in the world." In the late 1800s several young men decided to play a prank on Arcade Williams. They enlisted the help of Perry Coleman Howard, the village magistrate. Somehow they convinced Kade that her neighbor, Caswell Williams, had filed charges against her for trespassing on his property. They brought her before the magistrate. Kade called Mary Louise Williams ("Miss Med") as her witness, but Miss Med didn't show up for the hearing. A runner was sent to fetch her, and he came back with the news that Miss Med would be there "as soon as her collards were finished cooking." Perry Coleman declared that he had actually heard enough evidence and ruled in favor of Caswell. He "fined" Arcade $5.00. With that Arcade turned her back to the magistrate and hobbled away. When she reached the door she leaned on her cane, turned her head back to the court, and announced "If you want that five dollars, Coleman, you'll have to get it out of this." And with that she slapped her rear end and marched outside. ...and Collecting Ocracoke Island History & Stories. I hope our readers will bear with me as I share some philosophical ruminations today. I recently read a review of the book, Death and the Afterlife, by Samuel Scheffler. According to the reviewer, Scheffler "does not believe in any form of personal immortality," but he does understand that "the survival of people after our deaths matters greatly to us." Scheffler asks his readers to imagine scenarios that would rob us of what he calls a "collective afterlife." In one scenario, every person on Earth suddenly becomes infertile. Although everyone would continue to live to the end of his or her natural life, the human race would eventually die out. What would then matter to us? I wondered what I would think about collecting and sharing island history and stories. If I learned today that at the end of one hundred and twenty-five years there would be no one left on the planet...and certainly from now on no one would have any real interest in Ocracoke Island history...would I abandon my island research? Of course. What would be the point? I write for future generations as much as for the present. When I read books and articles of local history collected and written by departed islanders (Alice Rondthaler, Calvin O'Neal, Cecil Bragg, Walter Howard, and others) I often offer them a silent "thank you" for realizing that some of us living today would be grateful for what they saved and preserved during their lifetimes. Of course, I understand that our sun will eventually burn out (about 5 billion years from now), and that the human race might drive itself to extinction, and that geologic changes in the coast might inundate Ocracoke Island. But those time spans are longer than my human lifetime, and I, like many humans, don't want to think too much about ultimate death, wholesale destruction, and complete annihilation. So, I continue to collect and preserve Ocracoke Island stories and history. I suppose it's enough for me to think that several more generations, at least, may survive and benefit from my work. In my own way I am celebrating the "collective afterlife" even though I realize even that will not last forever. In the meantime I am ordering Scheffler's book...and will be reading it between researching Ocracoke Island hsitory. Kunigunde Howard was the daughter of German-speaking Hungarian immigrants. She met Ocracoke Island native, Lawton Howard, in the 1930s in Philadelphia. They soon married, and reared two boys, my brother, Lawton Jr., and me. This is a picture of my mother's 1914 Tauf-Zeugnis (Baptismal Certificate). If you enlarge the image you will see that she is given the name Kundi Czechmeister (for most of her early life she was Kunigunde Guth, but at the time of her baptism her father was using his mother's surname, probably because his parents had not married). And this is a 1946 photo of my mother. You can read more of her story here: http://www.villagecraftsmen.com/news061505.htm. 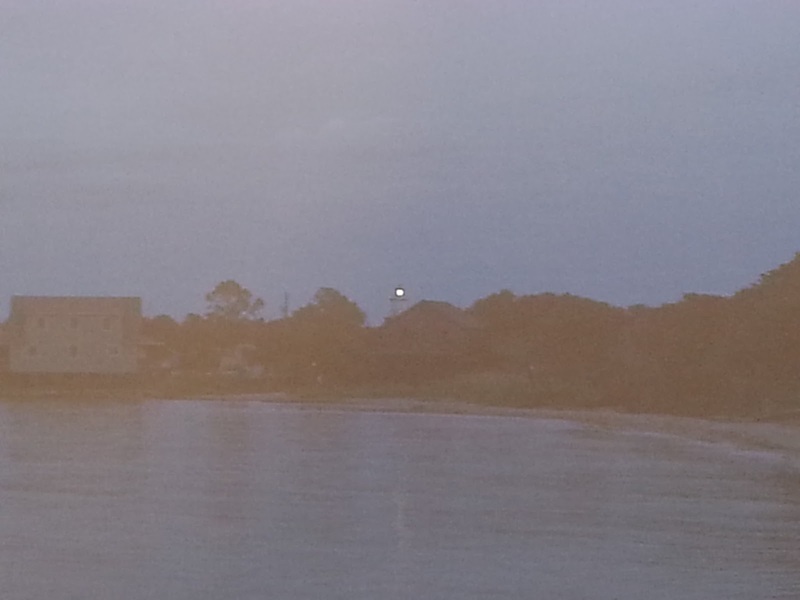 Ocracoke has a special beauty even in the half light of a dying day. This photo was taken from Springer's Point soon after the lighthouse came on. 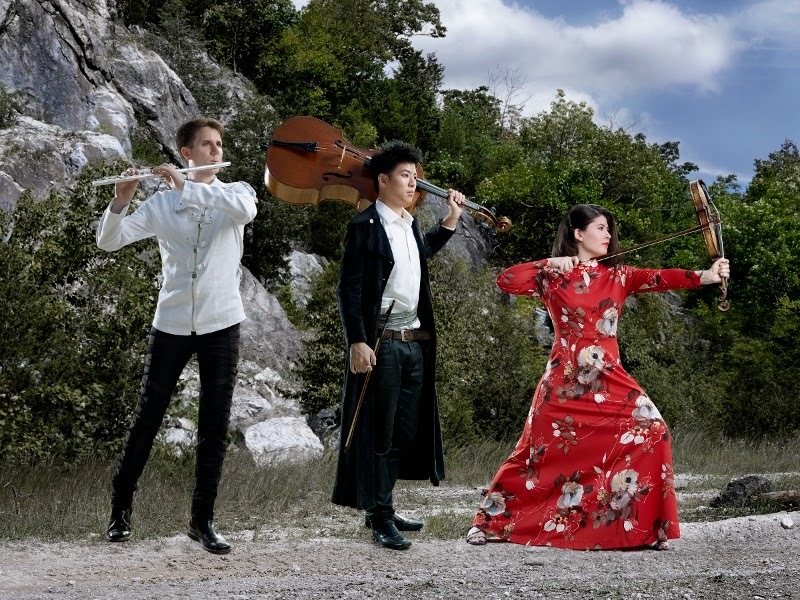 Tomorrow night at 8 pm at Deepwater Theater Ocracoke Alive, in conjunction with the Beaufort County Arts Council, presents a concert by the flute-violin-cello trio of Julliard graduates, Sonic Escape. From the Ocracoke Alive web site: "Sonic Escape uses every part of the performer - fingers, mind, voice & story - to reshape the live music experience. The virtuoso members have traveled the world in roles as diverse as soloing at Carnegie Hall, fiddle-dancing in Riverdance, jamming with Beale Street blues bands and playing rock clubs across NYC. Whether Sonic Escape is performing one of their ground-breaking original works, a folk arrangement or a classical masterpiece, they share with audiences as though it's the last note they'll ever play for the best friend they'll ever make! http://www.sonicescapemusic.com/"
Figs have been a big part of Ocracoke Island life for generations, especially in August & September when figs ripen. 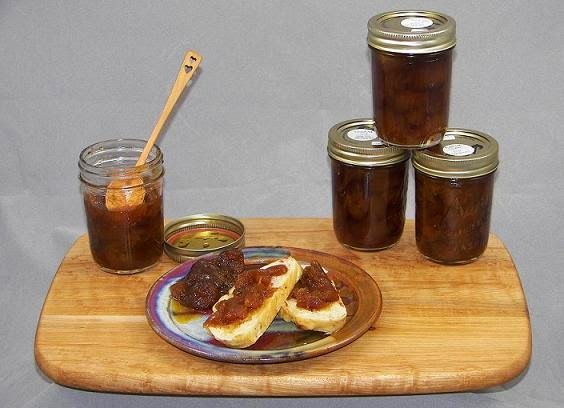 Village Craftsmen employee and native islander, Dale Mutro, follows in his grandmama's steps, and puts up many jars of fig preserves every season. You can listen to Dale and other islanders talk about figs, fig preserves, and fig cakes by following this link: http://video.unctv.org/video/2365329684/. The segment on Ocracoke figs begins at 14:17. The interview with Gaynelle Tillett is priceless! Tonight, at 8 pm at Deepwater Theater, the NC Humanities, in conjunction with Dare County Arts Council and Ocracoke Alive, will present "The Culture of Bluegrass Music in North Carolina: My life as an Accidental Bluegrass Musician" by John Santa, NC Humanities Council Roads Scholar. From Ocracoke Alives' web site: "Gathering in old tobacco barns and general stores across the state, the culture of Bluegrass music and the old South still permeates our everyday lives. While many people associate Kentucky with Bluegrass Music, the fact is many of the pioneers of this indigenous American art form were North Carolina born and bred. In fact, when one considers the confluences of African, Scottish and English musical heritage, a strong case can be made that Bluegrass was, in fact, born here. And there is no one more fervent than the recently converted! Using musical examples (both recorded and performed live) and personal anecdotes of travels across North Carolina from his book, Bluegrass Is My Second Language, the author seeks to illuminate the joys of Bluegrass music to the uninitiated." If you are on the island, come on out to Deepwater Theater tonight for some exciting entertainment!